What makes a “gaming” phone? It needs the power to play the latest mobile games with ease, with enough battery capacity and cooling to keep the fun going. Throw in a great screen, spectacular sound, simple-to-use software, and you have a winner, right? Almost. That was the Razer Phone. It fell short of being great because of its mediocre camera performance, especially when compared to the competition in its $700 price range. A good camera and features like IP67 water resistance aren’t optional anymore. After all, this is still a phone – it needs to play games in addition to everyday tasks like snapping photos at a birthday party, not instead of them. Razer now understands all of this, and the camera in the new Razer Phone 2 has been the focus of improvement. But we’re sad to say it’s still not good enough — especially for the higher $800 price tag. You’re spoiled for choice, and while the Razer Phone 2 nearly lands at the top of the leaderboard, its camera knocks it down a few pegs. Editor’s note: Razer is issuing an over-the-air update it claims will address camera image quality and performance, as well as fix the display issue we encountered. We will update this review after further testing. What do most flagship phones in 2018 have in common? Glass backs. It’s why even budget phones have glass on the back; it feels premium, even if it doesn’t offer any utility. But glass on most high-end phones does have purpose: The convenience of wireless charging, which doesn’t work with a metal back. That’s precisely what Razer has done with the Razer Phone 2. You can place the phone on a Qi wireless charging pad to juice it up, which certainly is convenient, and Razer is selling a 15-watt wireless charging stand as a separate accessory (for $100). We haven’t been able to test Razer’s wireless charger yet, but we have had some trouble with alternative wireless chargers, specifically wireless charging stands. The coil on the Razer Phone 2 is quite low, and the phone wouldn’t juice up on chargers like Google’s Pixel Stand or Samsung’s Wireless Charger Duo. Switching it to landscape mode worked, though it wasn’t ideal. Flat wireless chargers are a safer option, if you’re not opting for Razer’s own. Wireless charging is convenient and all, but glass does take points away for durability. The original Razer Phone felt like a tank; you could drop it and there’d hardly be a dent on the back. Now, you’ll want to slap on a case to protect the beautiful Gorilla Glass 5 exterior. Razer’s doubling down on the angular look, and we’re fans. It’s sharp, like James Bond in a tuxedo. Without a doubt, the glass back immediately delivers a more sophisticated look for the Razer Phone 2, and the darker black color helps make the Razer logo pop. It’s an RGB light now, and with the pre-installed Chroma app, you can make the logo glow whatever color you want, and even choose a pattern like “breathing” for a pulsating effect. It can even change color based on incoming notifications: An incoming Gmail will turn the logo red, for instance. These colors are set by the app developer, and aren’t customizable. The RGB logo is a fun addition that makes the phone look stunning — especially in the dark — but we often don’t place our phone with the screen facing down, so we hardly get to admire its beauty or see these notification alerts. The dual-camera module on the back is now centered above the Razer logo, with a flash in between both cameras. That’s about it in terms of flourishes, except for all the fingerprints you’ll leave behind thanks to the glass. 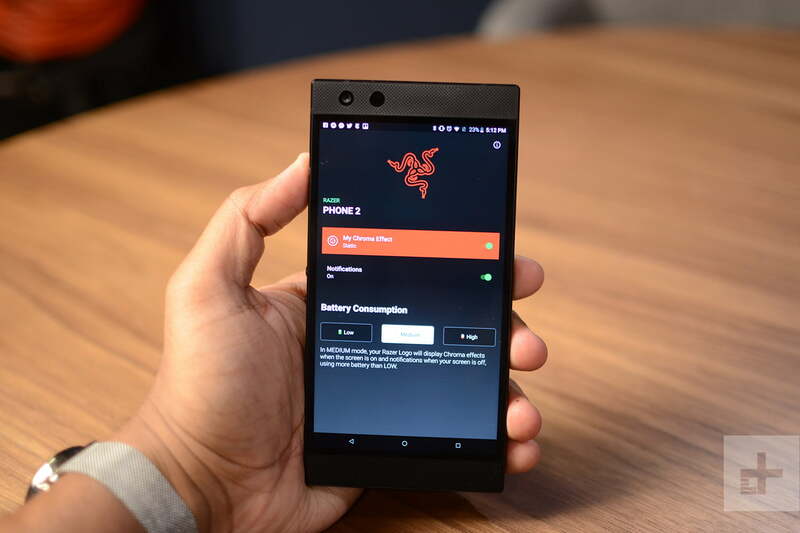 From the front, the Razer Phone 2 looks exactly the same as its predecessor. The speaker grills flanking the display are just as massive, and the screen has the same 5.7-inch size. The power button on the right doubles as a fingerprint sensor — it’s still hidden in the aluminum frame — and the volume rocker is comprised of two circular buttons on the left edge. Razer’s doubling down on the angular look, and we’re fans. It’s sharp, like James Bond in a tuxedo, and the flat edges deliver an excellent grip that ensures this phone never slips out of your hands. We like the difference in texture, going from the matte black aluminum edges, which is cool to the touch, to the even cooler glass back. It’s a big phone, but it’s not an edge-to-edge screen, so we were still able to reach all parts of the screen with one hand — we have larger hands though, so your mileage may vary. The 5.7-inch LCD IGZO screen supports HDR10 content, and the stereo speakers have Dolby Atmos certification — this is a phone meant to entertain. The screen is sharp with its 2,560 x 1,440 resolution, and the 120Hz refresh rate makes a return. More frames per second means fast-paced games look smoother, and scrolling around in apps like Instagram, Twitter, and the general Android operating system feels more fluid and responsive. It is the sole reason to buy this phone? No, but it’s a great perk. The screen is colorful, but blacks don’t look as deep as an OLED screen would offer. That being said, Razer has managed to make the screen 50 percent brighter, and the difference is stunning — when compared with the original Razer Phone. Dark scenes in Black Panther were far easier to see on the Razer Phone 2 over its predecessor. When compared next to the iPhone XS Max, YouTube clips in general were a tad brighter and more colorful on the iPhone thanks to the stronger contrast, but the Razer held up. 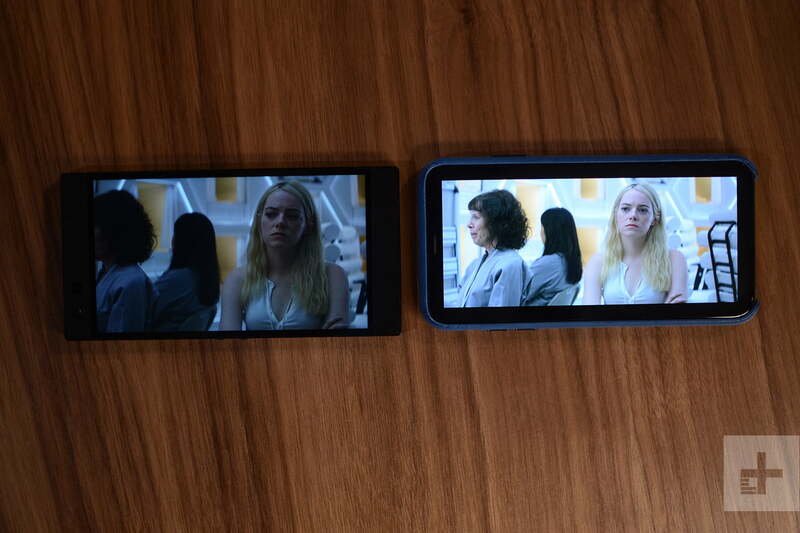 But we found some startling results in the Netflix app — shows and movies looked positively dark on the Razer Phone 2. We were able to see scenes much more clearly on the iPhone, but we were struggling on the Razer Phone 2. The company told Digital Trends an upcoming over-the-air update should fix this issue, and we’ll update this review when we can confirm it. In normal use, we had no issues with brightness, and we can see the screen outdoors in sunny conditions, though we had to crank the brightness to the max. Despite the Netflix bug we encountered, this screen is a great improvement. You can take this phone underwater up to a meter for 30 minutes, and it’ll perform without a problem afterwards. The speakers may look the same, but Razer said there’s now a much larger speaker box for improved sound output and bass response. It’s easily the best speaker system on a smartphone. We compared it with the Google Pixel 3, the iPhone XS Max, the Galaxy Note 9, and the LG V40’s Boombox speaker, and the Razer Phone 2 sounds the most balanced and rich. The competition can get just as loud, but they all sound tinny and muffled, whereas the Razer Phone 2 offered more dynamic audio. It’s excellent. One of the biggest hurdles with the Razer Phone 2 was finding a way to make the phone IP67 water resistant without sacrificing the speaker grills on the front, but the company succeeded. You can take this phone underwater up to a meter for 30 minutes, and it’ll perform without a problem afterwards. There’s no headphone jack, but Razer includes a THX-certified 24-bit Digital-to-Analog Converter (DAC) in the box. You can use with wired 3.5mm headphones, and it sounds good. The company is also offering a pair of USB Type-C earbuds with active noise canceling, but they’re sold separately. 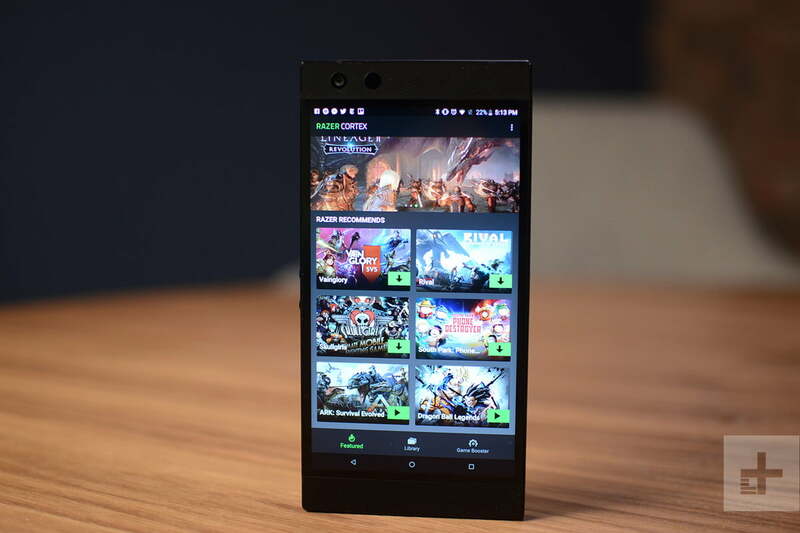 The Razer Phone 2, like many other Android flagships, is powered by Qualcomm’s Snapdragon 845 processor, but it packs a massive 8GB of RAM. Whether that much RAM is necessary is debatable, but we’ve yet to run into any problems with performance here. We played games like Dragon Ball Legends, Gear.Club, ARK: Survival Evolved, and Alto’s Odyssey at 120Hz and at the highest graphical settings, and the Razer Phone 2 never stuttered one bit. The phone got warm on the back, but we managed to game for a little more than an hour, and performance still never slowed down. Credit the new Vapor Chamber cooling system, which is a paper-thin sheet that sits in the middle of the phone, and helps spread heat across the entire surface of the phone. Razer claims you should hardly see any kind of performance throttling, and we haven’t. The Razer Phone 2’s AnTuTu score is right below Sony’s Xperia XZ3, which makes it the second highest performing Android phone in our benchmark tests (Apple’s iPhones are still higher). It’s safe to say you shouldn’t expect any problems throwing all sorts of tasks to this phone. Razer is continuing its partnership once again with the developer of popular third-party launcher, Nova Launcher. That means you’re getting a close to stock Android experience, with a simple-to-use Android launcher that’s deeply customizable. 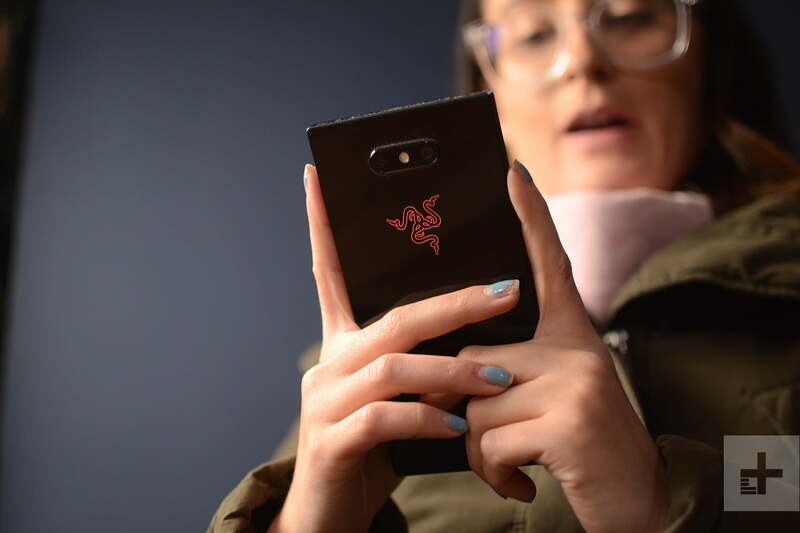 The only other pre-installed apps are from Razer, like Chroma, which lets you change the colors of the logo on the back of the phone. There’s also Razer Cortex, which is a game launcher akin to Nvidia’s GeForce Experience Windows app. Razer’s website lists a great deal of games that support the 120Hz screen, but the Cortex app only shows a handful — we’d like more choices and variety in the Cortex store. A feature called Game Booster lets you tweak exactly how you want your games to look and perform. You can turn down the resolution for smoother frame rates, or crank all settings to max for the best-looking image, frame rates be damned. It won’t work with all games, but it’s a handy tool that gives players a lot of control. The biggest downside with software on the Razer Phone 2 is that it’s not launching with Android 9 Pie, but Android 8.1 Oreo instead. The latest version of Google is definitely on the way, but Razer would not share a timeline for when we can expect it. 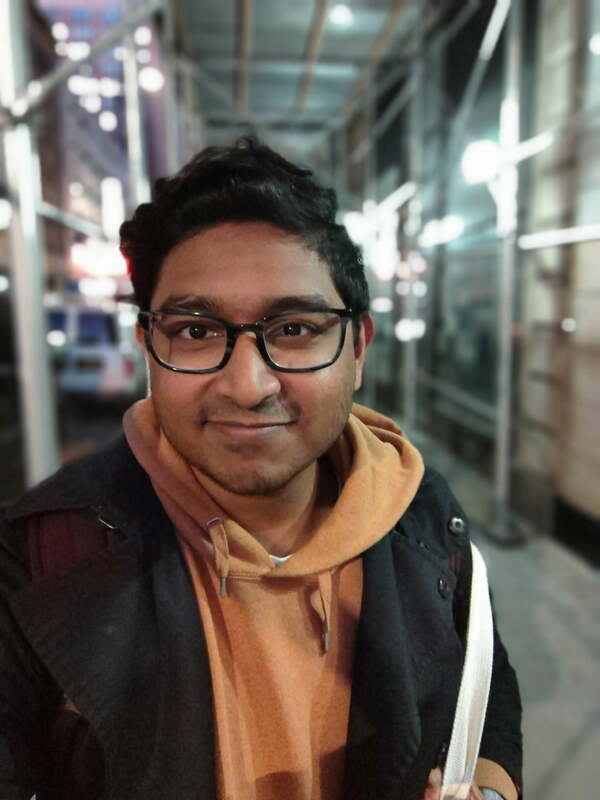 Razer has improved the camera with the Razer Phone 2, and while it’s definitely better, the bar was terribly low. It can take some good photos, but it’s not near the level it needs to be for an $800 phone. There are two 12-megapixel sensors on the back: One with f/1.75 aperture and optical image stabilization, and another with 2x zoom and a f/2.6 aperture. The much improved user interface is easier to follow, and there’s finally a dedicated button to quickly swap to the 2x optical lens. The camera app snaps pictures quickly, but there are a few bugs we’ve encountered, such as when it zooms in on a picture automatically when you try to look at it in the gallery. The camera app also froze at least twice. There’s decent HDR, but skies can still easily look blown out. Low-light photos are too grainy — and can sometimes be slightly blurry if you don’t stay incredibly still — but they do have good colors. The 2x optical zoom lens is a hit or miss — images can look detailed and colorful sometimes, but it has captured some poorly detailed photos. Some photos look over-sharpened as well. All in all, image quality is very inconsistent. Portrait Mode isn’t great. The phone applies such a soft focus that a lot of detail is simply lost. Photos end up looking very fuzzy. 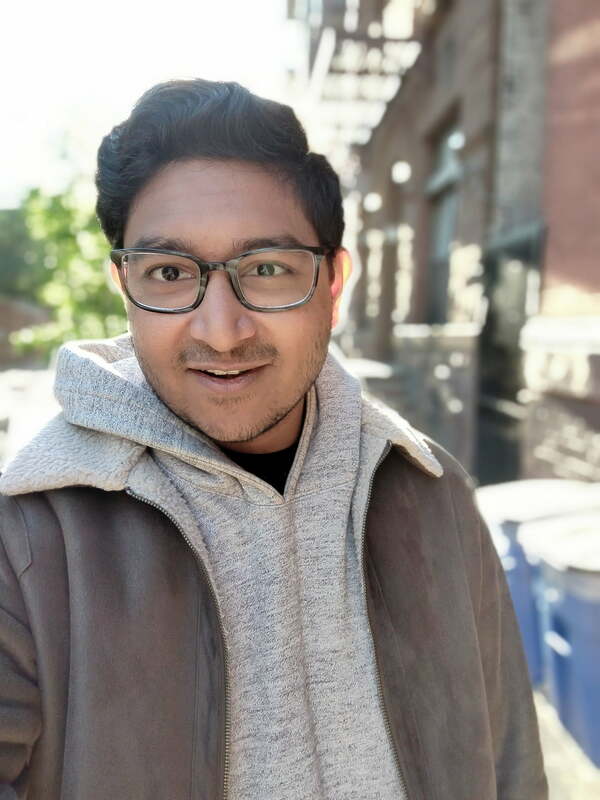 The same rings true with using Portrait Mode on the 8-megapixel front-facing camera, though we found it fares slightly better, with a bit more detail — especially with good lighting. A lot of our comments come after comparing these photos against similar ones taken by phones like the Pixel 3 or the iPhone XS, and the Razer Phone 2 consistently comes last. The Razer Phone 2 can snap photos relatively quickly, but the results do not match the quality we expect from an $800 phone. After looking at the photos, the camera frequently made us less enthusiastic to be creative when capturing photos. Cameras on phones in this price range are incredibly good now, and it’s a shame we can’t say the same here. Razer said an over-the-air update will improve camera image quality and performance, so we’ll be downloading and testing it to see if it changes our opinion on the camera for the better. If you’re able to game for longer periods of time, you’ll need a battery that can keep up. Razer has opted for a 4,000mAh battery again, which easily lasts a full day with high usage. We frequently arrived home with 35 percent left by 7 p.m. — that’s through gaming with the 120Hz screen turned on, the Chroma RGB on all the time, lots of picture taking, music streaming, and plenty of browsing. You can stretch that a lot more if you drop the screen to 60Hz and put the Chroma RGB on low power mode, which means it will only light up when you get a notification. With medium use, we ended up with 46 percent by 10:30 p.m. on these settings. With the right settings and usage, this phone can easily reach a second day on a single charge. What’s more, Razer is one of the few manufacturers supporting Qualcomm’s Quick Charge 4+, and by using the included charger, you can juice it up to 50 percent in just 30 minutes. We started charging the phone up from 18 percent at 5:25 p.m., and it reached 90 percent by 6:30 p.m. That’s among the fastest charging we’ve seen, especially on a phone with such a large battery. It supports Qi fast wireless charging, as mentioned before, but a wired USB Type-C charging cable will get the job done faster. If you opt for Razer’s wireless charging stand, it’s worth noting it has the same Chroma effect at the base like the back of the Razer Phone 2 — when you get notifications while charging, the base of the charger will light up in corresponding colors. The Razer Phone 2 costs $800 for the mirror gloss finish you see here, which comes with 64GB of internal storage (a MicroSD card slot is available in case you need more space). A satin-finish version costs $900, and includes 128GB of internal storage. Razer offers a standard one-year warranty on its products, and it covers only manufacturing defects. 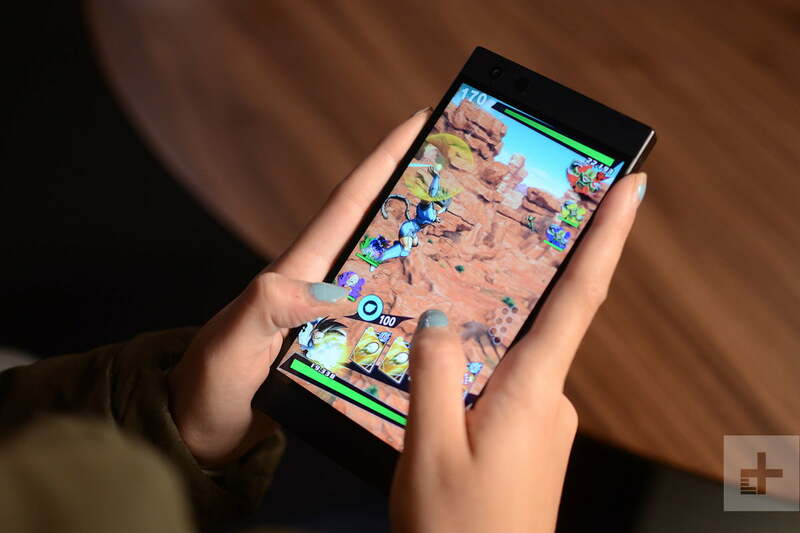 Great performance, simple software, long-lasting battery life, a solid screen with a high refresh rate, and stunning speakers — the Razer Phone 2 is undoubtedly an excellent gaming phone. Its fun RGB light is classic Razer. It’s just not an excellent flagship phone. For that, it needs a much better camera. Razer hiked the price $100 this year without delivering that necessity — though it did add IP67 water resistance and wireless charging — but it’s still hard to justify. Yes. Any flagship phone with a Snapdragon 845 processor will be more than sufficient for playing mobile games. However, not all of these phones have a battery up to the task. The Samsung Galaxy Note 9 does, and it packs in a much better camera too. It’s slightly more expensive, but it’s the better phone overall. The iPhone XS and XS Max also can play any game you want, and they pack excellent displays and great cameras. Keep an eye out on the Asus ROG phone as well, which we are currently reviewing. The Razer Phone 2 has exceptional build quality, and it will likely last you at least three years. Water resistance will prevent it from drowning, but the glass back does mean it’s less durable than last year’s model, so plan on a case for protection. This phone will get updated to Android 9 Pie, but it’s unclear if it will receive an update beyond it. No. There are plenty of alternatives that are just as capable as the Razer Phone 2 for gaming, and they all have significantly better cameras. We really do like this phone, but its camera performance is a drag. Now if you absolutely do not care about taking pictures — if you rarely open your camera app — then you will fall in love with this phone.